It’s a white party over at Our Creative Corner! That’s right. The challenge is to make a card or project using only white products. To give an all white creation some interest, a tip suggested at OCC is to “enhance with textures and patterns.” Embossing, pearls and lace, scalloped patterned vellum and a white rose all came together for this card. This was so fun! What a great challenge! Stunning design and gorgeous card. Fabulous card, Susan!! Love the scalloped vellum with the lace and touches of pearls. Such a wonderful soft feel to this card! Lovely!! WOW! This is absolutely one of the most beautiful wedding cards ever! Simply stunning Susan! Absolutely beautiful! Susan this is stunning! Ohh La La! So BEAUTIFUL, Love it! Be still my heart…this is just gorgeous, Susan! Susan, this is absolutely gorgeous! I love all of the different textures you used! I love the layers of lace and scallop boders on your card! So pretty! Oh my, how gorgeous is this??? Just absolutely lovely! That patterned vellum is so perfect for this piece – with all the texture, I think the vellum is a perfect finishing touch! So happy you took us up on our White Party challenge this week at Our Creative Corner. Hope to see you back again with us next week. Wow, that is a beauty! What a touch challenge. You handled it beautifully, Susan. Your card is gorgeous! This is beautiful Susan, what a great combination of textures and products. I will keep this beauty in mind as I make wedding cards this summer. Oh my! This is a beautiful card! Oh my Susan this is just Stunning, I so love your mixture of vellum, lace and pearls. That lace bow with the rose and pearls is so sweet, Love everything about it! Oh, I love white on white! Beautiful! 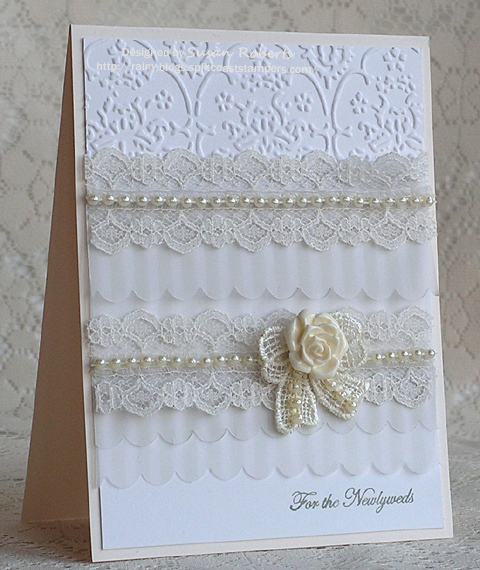 Ooooh, white on white makes for one gorgeous and elegant card, Susan….I love all the lace and pearls you added….perfect for a wedding card!!!! Amazing job on this challenge! I really like the elegant and light feel of this card! Love how you added scallops out of vellum! And lase and pearls, and bow look so pretty together! Amazing job on this challenge! I really like the elegant and light feel of this card! Love how you added scallops out of vellum! And lace and pearls, and bow look so pretty together! Wit Whewwwwwwww, that’s absolutely STUNNING, Susan! so far behind in my reader…just catching up a wee bit today. This is so pretty. I went to JoAnn’s last week and bought some little satin flowers to make an all white wedding card (that I have not made yet) Thanks for the inspiration!!! I am so glad you liked my challenge! 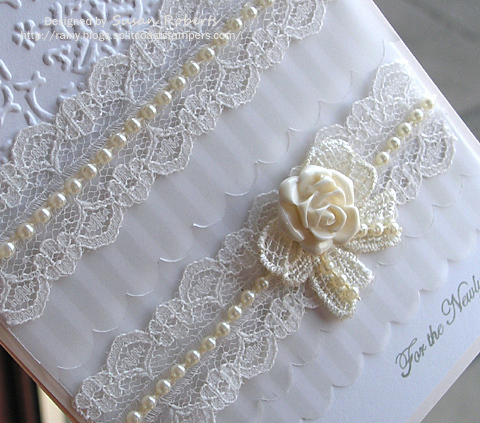 This is a gorgeous wedding card, I love the scalloped vellum and the lace is so delicate and lovely. Great job on the challenge, thanks for joining the OCC’s White party challenge! Extraordinarily gorgeous! Words fail me. Breathtaking! Gorgeous! Love the embellishments and embossing and scallops!